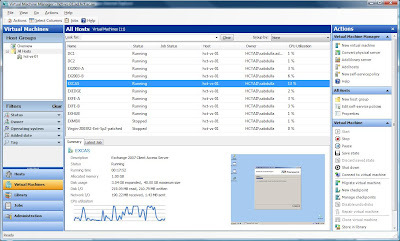 On November 30, 2007, the Exchange Server 2007 service pack 1 will be ready for download on the Microsoft website. The Service Pack is much awaited by the Exchange Server community and customers alike, with the long list of new features that the service pack promises. The new features include new deployment options, new features and improvements for each server role, improved integration with other applications, and even a new, third type of continuous replication. If I were to mention each of the new features, this would become a really long, long, blog post. I encourage you to view the list on the Technet website. Microsoft and India’s Reliance Communications have signed a 500-million-dollar deal to launch India’s first high-definition Internet TV service. Microsoft TV, known as Microsoft Mediaroom, the new IPTV service from Microsoft, will bring the world-class digital TV concept to homes in India. The service is expected to start early next year in 30 Indian cities. About 71-million homes in India, a country of 1.1 billion people already have television sets, and 61 percent of them have pay TV, mainly through cable and satellite. Reliance Communications owns and operates the world’s largest Internet connectivity infrastructure with 165,000 km of fibre-optic cable that spans India, the US and Europe! Reliance is also India’s second-largest telecom firm. I recently read with interest the press release regarding this. Microsoft is penetrating homes! Microsoft has taken an equity stake in the social networking website, Facebook and, in return, gets to expand its exclusive advertising deal to handle ads for Facebook on a global basis. Facebook didn’t come cheap. Microsoft is spending $240 million for roughly a 1.6 percent stake, based on an overall valuation of privately-held Facebook at $15 billion. Not bad, considering the fact that Facebook is a company that was founded by three Harvard students in their dorm room in February 2004. 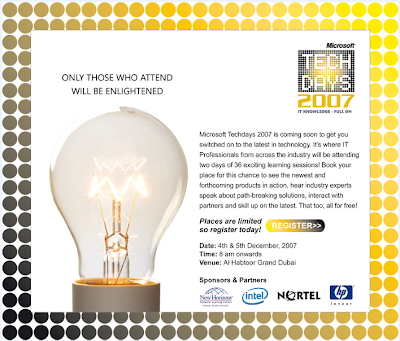 Microsoft had signed up an advertising deal with Facebook in August 2006, which made Microsoft adCenter the exclusive banner and link advertising partner for Facebook. But this was limited to the US. Now Microsoft opens new doors in expanding its advertising outreach globally by acquiring a stake in the social networking site. Of late, we are seeing a rush from Microsoft to follow the trends that Google and Yahoo are making in terms of advertising through online services. Windows Live is getting bigger, better and smarter everyday with newer features being added. Facebook is the only social networking site that is not blocked by the ISP in the UAE (Etisalat). Hmm. I once had a computer that showed the above BIOS message while booting when the keyboard connection got loose from the PS/2 port. I had always wondered what it meant. Just remembered it now, blogged it now! I don’t know about you, but I’m going to be there when it happens. Register here.